For a person who is not an automotive enthusiast, I really seem to like photographing cars. I shot this at the Cowtown Vette annual show. I really like the perspective and strong color I got on this. Especially considering that this was taken in midday sun, I am very pleased with the result. Some self critiquenow, mostly to see if the in-challenge comments agree with me. The shot could have used a little more of the nose of the car in the frame, however, the hood was raised and jutting in slightly at the top, so it had to be cropped out. The open door hurts the swoopy lines a little as well, but you don't touch someone else's classic car at a show. Another entry that I think is really showing some improvement in my photography, but also another one that won't surprise me if it gets creamed in voting. I am realizing my preferences are not DPC average. I'm pleased with the performance of this shot, though I had hopes of a 6 for a little while during voting. A good score for me, though, and well above my average. 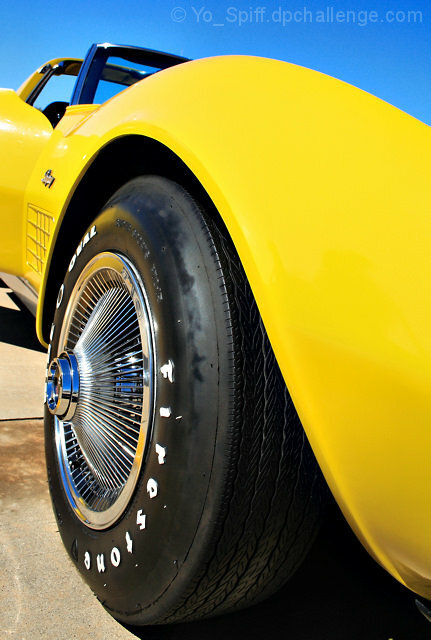 A couple of commenters made mention of the focus on the tire as a major element of the image that they didn't care for. That is actually one of the aspects of the shot that I really like. The close wideangle view makes this look almost like a caricature of itself. Proficiat on your 17th place here Steve. It's a classy shot which I voted a 6 on during the voting period. Haha. Great shot. The funny thing is that your title talks about the price of their toys, but the focus is on the tire/rims (or at least that's what I perceive it to be). With this title, I'd like to see more of the car!!! Either way, not scoring on the title... haha. Great bold colors and nice close crop. The car is nice and the sky is a gorgeous blue. Well done. I love the colors and saturation. There might be some slight haloing in the sky, but otherwise, this is nice. More focus on the lines of the car rather than the tire would have set this up a bit better I think. Proudly hosted by Sargasso Networks. Current Server Time: 04/21/2019 02:07:59 AM EDT.